In early 1995, Rivers Cuomo ’98-’06 sat down at a piano and sang into a microphone. The recording, dubbed “Longtime Sunshine,” never made it onto an album. But, within months of singing it, Cuomo’s wishes came true—he matriculated as an undergraduate at Harvard College in the fall of that year. However, critics were quick to write the band off as a flash in the pan, and Cuomo was, by no means, a household name. While here, Cuomo wrote six songs and for a poorly-selling album called “Pinkerton.” He then left Harvard to tour. One turbulent decade later, he’s finally graduating. Nowadays, Weezer is one of the biggest-selling and best-known acts of its generation, selling out arenas across the world. “Pinkerton” has, over the years, become one of the most influential rock records of the decade. The 35-year-old Cuomo, with his thick-rimmed glasses and quiet voice, has become the archetype—whether he likes it or not—of “geek rock.” Some have called him the godfather of the “Emo” revolution. Cuomo seems to be a changed man. In the fall of 2004, he returned to Harvard for a semester, and he’s back to finish this spring. He’s taken a vow of celibacy, and is a vigorous practitioner of meditation. He’s clean-shaven, and he lives in Cabot. Most importantly, he’s about to get married. The Crimson sat down with Cuomo for a rare interview in Cabot Dining Hall last week. Usually reluctant to talk about his personal life, Cuomo opened up, speaking for the first time about how the pains of his Harvard years inspired his music, how a girl in his Expos class wrote part of one of his most famous songs, and—for the first time anywhere—what he thinks about his impending marriage. The Harvard Crimson: Why did you decide to come back to Harvard in 2004? Rivers Cuomo: I always have a tough time with “why” questions. There are probably several reasons for coming back in 2004. One of them was definitely wanting to find somebody. THC: So, you weren’t involved with your fiancée at that point? RC: Right. You know, I wonder—if I was engaged at that point, maybe I wouldn’t have come back to school. THC: It wasn’t particularly out of a desire to finish your degree? RC: Well, that was there, too. A desire to finish what I started, and also just a love of learning. A desire to take a break from music. THC: When you were here in Fall 2004, were you dating? Were you going on dates with students? RC: I wasn’t dating, but I was just…I was…I definitely had my eyes open. But, I don’t think I technically went on any dates. But, you know, I’d have dinner in the dining hall here. THC: You started out as a Music concentrator, but then you switched to English. Why? RC: I…[long pause]…I felt like I didn’t really know how to play an instrument. I felt like, although I haven’t been playing a serious musical instrument for all my life, I have been working on English. THC: What’s been your favorite English class? RC: I loved Creative Nonfiction Writing with Kyoko Mori. I loved Shakespeare with Gordon Teskey. And I’m really getting a lot out of my classes, this semester, with Lynn Festa. THC: What do you think your favorite course has been, since you’ve been here? RC: So many. Music 51 [Music 51, “Theory I”] immediately comes to mind, with John Stewart. I feel like I got a lot out of that class that is gonna stick with me for the rest of my life…All those little chord progressions and voice leadings—they’re in my bones, as well as my ear. THC: Do you think a lot of that went into specific aspects of your music that weren’t there on “The Blue Album”? THC: Are there any professors you’ve had a close relationship with? RC: Yeah, I had a very close relationship with my Expos teacher, Naomi Stephen. At that time, I was working on the “Pinkerton” songs a lot, so I feel like she was, in a way, a collaborator and an influence. THC: Would you go to her with lyrics you’d been working on, and she’d critique? RC: I would discuss with her the emotional and romantic situations in my life, and we’d talk about ways to express that in art, and what ways other artists have expressed that. [Pause] I can’t be too specific, because it involves other people’s private lives. But one example is, in “Pinkerton,” in “El Scorcho,” two lines in the song are actually taken from someone else’s essay in my Expos class. THC: Really? Can you tell us which lines? THC: When did you meet your fiancée, [32-year-old Kyoko Ito]? THC: But you’ve only recently gotten engaged. Did you guys lose touch between then? RC: We were friends for many years, and then she moved back to Japan. THC: There is a stereotype about you, that you have a certain affinity, both in friendship and romance, for Asian girls. Do you feel that you’ve gotten any understanding of that here? Or with your fiancée? What is this fascination with women of Asian descent? THC: You said in your MySpace blog [www.riverscuomo.com] that you view your decision to get married as something close to choosing a lifestyle, rather than being swept up with emotion. Is that still how you feel? Do you have doubts? RC: I think I’ve been skeptical of violent passion for a long time. I think “Pinkerton” is about that, a lot—seeing how, every time I’ve felt really passionate for someone, as soon as I “acquire” them, or feel like I’ve acquired them, the passion goes away. That’s how that album concludes, and I just don’t feel secure in that, for a life. I want to build my life on something more stable. THC: But I assume you do feel romantic affection for your fiancée? How would you characterize your relationship? Do you have to justify it? RC: You know, so far, no one’s really asked me about it. This is the first time. THC: Many people found out about your engagement solely through your blog. Why did you choose that medium? THC: Now, you’re saying you want to break away from Weezer fan-girls, but wasn’t [your fiancée] a Weezer fan-girl? What was she doing at this solo concert back in 1997? RC: Well, I know she was a Weezer fan, and I presume that’s why she was there. THC: So, has that dynamic ever interfered with your relationship? THC: You have said in the past that you were relatively “anonymous” while you were here in the ’90s. Did people really not know who you were? RC: It’s hard for people of your age, I think, to remember at that time, even though Weezer was popular and had a very successful album, I wasn’t singled out as a celebrity. We were kind of a faceless band. I walk into Harvard with pretty long hair and a really long, bushy beard, glasses, walked with a cane. And, on top of that fact, our album was not successful with college kids—it was successful with ten-year-olds! RC: Yeah. Kids loved it. But college kids didn’t. It’s interesting, because the same thing is happening now. The people who loved “Beverly Hills” are primarily younger kids. THC: Could you tell me about the experiences that led you to write “El Scorcho”? RC: Yeah, I’d love to tell you all the juicy details, but I…I’m not concerned for my own privacy, but for someone else. I know she doesn’t want anyone to know anything. So I can’t say anything. THC: Do you keep in contact with her about it? THC: Obviously, “Pink Triangle” [a ballad about a man falling in love with a lesbian] seems to be about a different girl—are the six songs [on “Pinkerton”] about just those two, or were there a number of girls that you were romantically intertwined with? RC: That was a different girl. We weren’t exactly “intertwined”—it’s just, I saw her in class and I had a crush on her. I think we were hardly even talking. Actually, that’s the best phase of a relationship to write songs—before you even really know anything about the person! THC: In your initial days at Harvard, you sounded conflicted, in interviews, about whether your anonymity was a positive thing. Which was the more dominant emotion? Feeling isolated, or feeling glad to be isolated? RC: [Laughs] I think I was probably…[Pause] Thinking back on it, I can see how silly I was, but, ultimately, I think I was happy that I was isolated and going through tough times, and in pain. THC: You were also in physical pain—you had just undergone an operation on your leg, and were in a brace. Do you think that the leg brace changed either your experiences at Harvard or your songwriting at the time? THC: So, you’re trying to rid yourself of pain, but it sounds like [writing “Pinkerton”] was a really powerful experience because of the pain that you went through. Do you feel like you still need to stick a knife into yourself, emotionally? RC: No! No more knives! THC: What are some of the topics that you’re writing about now? RC: I’m working on a song called “Pig,” which, ah, follows the life of a pig, from when it’s just a little piglet on the farm, playing with other animals, to a point where it’s grown up and married and has kids, but then it eventually [laughs], it gets slaughtered! THC: Hopefully, this isn’t semi-autobiographical? RC: Not intentionally, no. But, he’s singing to the farmer at the end of the song. He’s forgiving him. As he’s going to be slaughtered. THC: Are the classes affecting your songwriting? RC: [Laughs] I haven’t done enough writing lately to know how [they’ve] influenced me. I can say that we’re reading a book—“Stedman’s Surinam”—and a lot of the descriptions of the treatment of the slaves in this book are very moving, and it’s very likely that that could result in a song that’s an observation of the slave-master relationship. I was thinking maybe, like the structure of that Cat Stevens song, “Father and Son.” Do you know it? He sings two different characters: in the low octave, he sings the voice of the father, and then he jumps up an octave and sings the voice of the son. So, I could do that same thing with the slave and master. THC: How do you make friends here? Do people come up to you? RC: Yeah, it’s great—that’s the best part about being famous, is that people want to get to know me. People come up to me and introduce themselves, and I make friends, and then I meet their friends. It seems like I have a very happy and comfortable social life, which is something I never had when I was younger. THC: How close do you feel to the friends you’ve made here? Do you plan to keep in contact with them after you graduate, or are they just fun people to be acquaintances with while you’re here, and then you’re going to go back to your L.A. friends and your bandmates? RC: [Long pause] I don’t know. I guess that’d be a good question for any graduating student. I guess I’m totally open to it, and my friends will know how to get in touch with me. THC: How often do you respond to e-mails and Facebook messages? RC: In 2004, I responded to everyone. But, this semester, I’ve kinda stopped doing that. THC: Just because you’re not looking for somebody anymore? RC: I think so. I just…enh­...which is pretty selfish, I guess. THC: Have you gone to any musical performances on campus? Do you have friends that you go see performances of? RC: Yeah, I have friends in [Asian-music-oriented a capella group] C-Sharp, and I think they’re great. I really love those songs. If there was one group I would join, that would be it. But, I don’t speak Chinese, so it would be tough. THC: Would you ever do a campus performance? A coffee house? RC: I went to the coffee house here a few times, and I came close to going up there, but…I just…I don’t like feeling nervous! THC: Why do you still feel nervous about performing? RC: [Pause] I don’t even really know…It’s just like a physical feeling of fear. It’s the fight-or-flight response. THC: What’s more nerve-wracking—an exam, or a show? RC: The most nerve-wracking experience is an oral presentation in class. And right under that would be doing “Saturday Night Live” or “David Letterman.” One of those shows. THC: If Rivers, as of graduation, could go back in time and talk to Rivers, as of matriculation, what would he say to that other Rivers? THC: Has Harvard humbled you or made you more self-assured? RC: It’s humbled me, massively. THC: But copies of your grade transcripts are online, and you were getting all A’s, at least in the ’90s. RC: I don’t know that I’m intellectually on par with everyone. I have gotten really good grades, but, perhaps, like a lot of people here, I feel that I’m not as smart as everyone else. I’m just constantly amazed at how smart everyone is, and how articulate they are, and how insightful…it’s very humbling. THC: So, do you plan to come back? If you’re touring Boston, will you just come back to the campus? RC: Oh, I definitely will. But I suspect that no one will notice me. 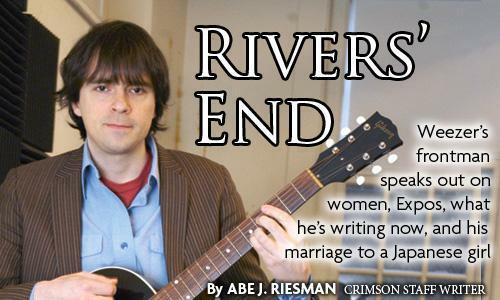 —Staff writer Abe J. Riesman can be reached at riesman@fas.harvard.edu.